It's time for another edition of How Do You Wear It! 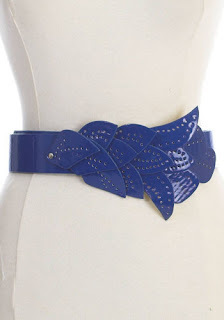 This time around, MizzJ and I are both creating outfits around this leaf belt ($29.99) from Modcloth.com. With its blue hue and eye-catching leaf details, this patent belt is a whimsical riff on the wide statement belts we've seen a lot of lately. The leaf motif is straight out of nature, which reminds me of being outdoors, which reminds me that this is wedding season and many people are probably going to be attending wedding ceremonies or receptions outdoors. (Isn't free association wonderful?) So, my outfit is going to be a breezy ensemble for a guest at a casual West coast outdoor wedding in the afternoon, followed by an outdoor reception. As a wedding guest who'll be spending a lot of time outdoors on a hot sunny day, the last thing you want to do is sweat profusely or fuss with a constricting outfit. I kept things simple and loose by pairing the belt with the flowy Vila dress from Oli. 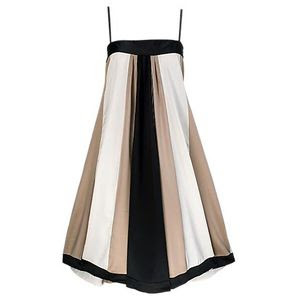 The silhouette is loose enough to disguise any belly bulge from overindulgence at the reception and lets you breathe, while the vertical lines elongate your body. Cinched over the dress, the blue leaf belt defines a narrow waistline and makes a distinctive accent piece. Next, add some cute shoes and a wristlet. I chose these vintage yellow wedge sandals for their looks, comfort, and practicality. The straps are wide and soft-looking so they won't dig into your feet, and the wedge heel won't get stuck in the lawn during photo sessions. Also, as a salsa dancer, I appreciate how the ankle straps keep your feet in place while you're on the dance floor. 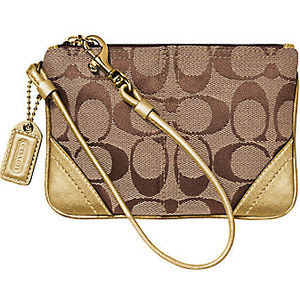 Wristlets are just large enough for some essentials but not so big that they'll be bothersome later in the evening. I went for a Coach wristlet ($48) with some gold accents to play off the warmth of the beige in the dress and the yellow in the heels. When dressing for a big night out where you can expect to perspire (whether because of the weather or the dancing), I like to skip the statement necklaces. Instead, I prefer dangly statement earrings. 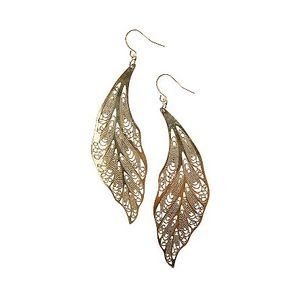 These gold leaf-shaped filigree earrings again play off the warmth of the other pieces in the outfit, and echo the leaf motif of the belt. Finally, I chose a black bolero cardigan to keep bare shoulders warm at night, and Neutrogena Fresh Cooling Mist Sunblock for some much-needed sun protection and refreshment. Share the sunblock with other guests at your table; they'll be grateful you were smart and sensible enough to bring it! Update: MizzJ posted how she'd wear the green version of the leaf belt here.